This equestrian vacation along the beautiful Ring of Kerry in Ireland will be open for bidding at the silent auction during the Washington International Horse Show (WIHS) October 26-31, 2010. As fall and winter approaches, we're adding new choices for travelers looking to escape to somewhere warm and beautiful to ride horses. Check out our newest vacations in Mexico and South America's small hidden gem, Uruguay. Equitrekking host Darley Newman will be live in studio in New York City on Martha Stewart Living Radio's "Morning Living" on Sirius 112/XM 157 on Monday, July 12th at 8am ET. Learn more about how to listen at SIRIUS Satellite Radio. Equitrekking was honored with a third Daytime Emmy nomination at the 37th Annual Daytime Creative Arts and Entertainment Emmy Awards gala in the California Ballroom of the Westin Bonaventure Hotel in downtown Los Angeles. All dressed up for the black tie affair, Executive Producer Chip Ward and host Darley Newman mingled with fellow nominees including soap and reality stars and music producers. Read more about the event in Darley's Blog. Equitrekking Host Darley Newman talks Irish Castles and equestrian vacations on the Tack & Habit Radio Show on the Horse Radio Network. Equitrekking host Darley Newman and more of the Equitrekking team were at the Upperville Horse Show on Saturday, June 12th, where EquitrekkingTravel.com sponsored a booth and Equitrekking filmed several interviews. Darley was able to meet and interview Aaron Vale, who won Sunday's $100,000 Grand Prix. Upperville is touted as the oldest horse show in the United States. 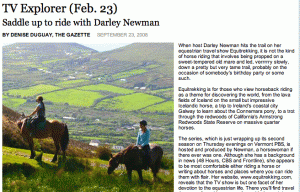 Equitrekking host Darley Newman has just returned from her third trip to ride horses in Ireland. Equitrekking Travel's Julie Snyder accompanied Darley, so Julie could become an expert on Irish horseback riding vacations. Julie and Darley rode horses at each of the equestrian vacation destinations offerred by Equitrekking Travel, so Julie could experience each ride and better advise travelers looking to enjoy an equestrian vacation in Ireland. Darley and Julie also checked out three new destinations that will soon be added to Equitrekking Travel's premiere featured list. Stay tuned for more on Ireland and read Darley's Travel Blog on her adventures riding in Ireland. 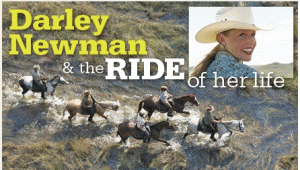 Come meet Equitrekking host Darley Newman at the Columbus, Ohio Equine Affaire. Darley is scheduled to speak on Thursday, April 8th at 12 pm on "Equitrekking: The Importance of Horses in International Cultures" and 2pm on "Exploring the World on Horseback." On Friday, April 9 at 1:00 pm, join Darley to countdown "The Top 10 Places to Ride Before You Die." You can also meet Darley and Equitrekking Travel's Preferred Travel Agent Julie Snyder in the Bricker Building at booth 534, where they'll share information on Equitrekking Travel. The Equitrekking team including host and producer Darley Newman rode horses in Middlbeburg, Virginia to support Ride for the Cure Virginia and raise awarness and funding for the Susan G. Komen Breast Cancer Foundation. The team filmed the events and put together a video to raise awareness and attendence for next year's event. Watch the video. At a star studded black tie gala in LA, the Equitrekking team accepted a Daytime Emmy for Outstanding Single Camera Photography. Congrats to Director of Photography Greg Barna, host and producer Darley Newman and executive producer Chip Ward. Equitrekking was also honored with a nomination for Outstanding Special Class Series. Read more in Darley's Blog. Darley and Equitrekking were honored with First Prize for Best Travel Broadcast in the North American Travel Journalist Awards Competition and the Equitrekking: Travel Adventures on Horseback book received the Merit Award. 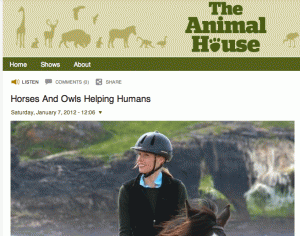 Emmy-winning TV show expands digital resources for families interested in equestrian camps, children’s programs at dude ranches and riding holidays for families and kids with the Equitrekking Horse Camps Guide and Top20HorseCamps.com. Equitrekking today announced the first-ever online guide dedicated exclusively to equestrian camps both in the USA and around the world. The Equitrekking Horse Camps Guide features top equestrian camps, kids’ programs at dude ranches, family camps with an equestrian focus and riding holidays for kids—resources to help young riders and adults plan educational adventures focused on horseback riding. The team also debuted Top20HorseCamps.com showcasing some of the most elite equestrian camps for younger riders. Camps featured include a Colorado summer camp that welcomes unaccompanied youth to ride the Rocky Mountains and learn horse care, an equestrian camp that for over twenty years has hosted global teens on a generations-old Irish horse farm in Tipperary, a North Carolina summer camp where kids learn traditional hunt seat riding with the University of South Carolina Equestrian Team's horses and beyond. Camps cater to all skill levels and varied disciplines including Dressage, cross country, Western style riding, show jumping and horse show experiences. While some camps welcome riders to stay up to a week, others offer a family camp experience, where kids and their parents may travel and enjoy camp together. Many camps feature range of activities including archery, swimming, the arts, hockey, basketball and beyond and are accredited by leading organizations including the American Camp Association, The International Camping Fellowship and Certified Horsemanship Association. A pioneer in the field of equestrian travel and travel television, Equitrekking’s new guides are modeled after Equitrekking’s current popular resources for travelers who want to saddle up on vacation. These include Top20Ranches.com, the Equitrekking Vacation Guide, Equitrekking Travel Deals and EquitrekkingTravel.com. The sites help visitors to research and plan vacations with a riding focus, as far afield at Jordan and Botswana and as close to home as Ireland, Wyoming and Vermont. Travelers can book directly with small, family-owned tour operators or book through Equitrekking Travel’s equestrian travel agent specialist. Come to the Certified Horsemanship Association (CHA) International Conference October 23 – 26, 2014 at the Marriott Griffin Gate Hotel in Lexington, Kentucky and hear a vibrant keynote address with video of travel adventures on horseback from Darley Newman host of Equitrekking on PBS – Create TV. The CHA annual conference is open to the public and has opportunities for attendees to ride in sessions on great school horses with top instructors. Visit cha-ahse.org to see registration information and the tentative schedule of events. This year it will be in Lexington, Kentucky with all horse events located at the Kentucky Horse Park. Darley Newman, who was on The Today Show with Hoda and Kathie Lee this morning, is a travel expert, published author and the host, writer and producer of Equitrekking, the Emmy-Award winning PBS TV series. Darley Newman has spent the past few years traveling the globe. Broadcast across the U.S. and in over 82 countries worldwide, each episode takes Darley and her viewers on a journey with local people to the best adventure hotspots, restaurants, cities and nature escapes. Darley has been honored with five Daytime Emmy Award nominations for hosting, writing and producing Equitrekking. She received the North American Travel Journalist Award two years in a row for Best Travel Broadcast and the Merit Award for Best Travel Book. She was recently honored with the Inspiring Woman Award from Women in Philanthropy and Leadership. She has been profiled in USA Today, Chicago Tribune, Washington Post, NPR and has graced the cover of a variety of travel and lifestyle magazines. She has produced for CBS, PBS and various documentaries and series and received her B.A. in Electronic Media and International Business and Cultures from The George Washington University. She is also the founder of EquitrekkingTravel.com, featuring exceptional equestrian vacations, Top20Ranches.com, featuring great ranch vacations, and Equitrekking.com, the companion website to the Emmy-winning TV show. See you there! The purpose of CHA is to promote excellence in safety and education for the benefit of the horse industry. CHA certifies instructors and trail guides, accredits equestrian facilities, publishes educational manuals, produces educational horsemanship DVDs and hosts regional and international conferences. For more information on the Certified Horsemanship Association, please visit www.CHA-ahse.org or call 859-259-3399. To find a certified horseback riding instructor or accredited equine facility near you visit www.CHAinstructors.com. The travel experts at Equitrekking have launched the “50 State Trail Riding Project” to promote trail riding in every U.S. state. The new project furthers Equitrekking’s greater mission to inspire more people, particularly youths, to get outdoors and horseback ride, and to raise awareness of the need to preserve trails for equestrians across the USA. The Equitrekking team crisscrosses the globe to find the best places to horseback ride and films them for the Emmy Award-winning PBS TV show Equitrekking and the popular companion website Equitrekking.com. 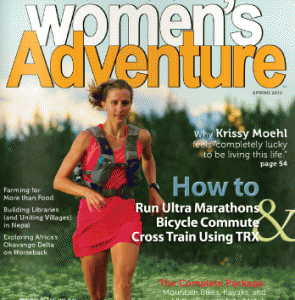 Guest writers are encouraged to submit articles on their favorite trails in their home states. Articles will be published on Equitrekking.com, in the Equitrekking newsletter and promoted via Equitrekking’s social media. The popular website focuses on great places to ride horses, including on vacation, and also provides deep resources for people of all ages to enjoy America’s great natural spaces. The Equitrekking team has already received the first post in the “50 State Trail Riding Project” from a member of the Delaware Equine Council, who wrote about places to trail ride in Delaware’s three counties, including trails at Brandywine Creek State Park, Lums Pond State Park, and Delaware’s beaches. Equitrekking’s unique focus and worldwide distribution has motivated tens of millions of viewers on PBS and around the world to watch Equitrekking regularly and many to get back in the saddle at local stables and riding vacation destinations around the world. Learn more about how you can contribute to Equitrekking’s 50 State Trail Riding Project. Read the first post on Delaware. Equitrekking is the Emmy Award-winning lifestyle television series that takes viewers on global travel and horseback riding adventures to experience culture, cuisine, history and nature. Hosted by travel expert and equestrian Darley Newman, Equitrekking broadcasts in high definition on PBS in North America and on international networks in over 82 countries, including Horse & Country TV in the UK, Ireland, Scandinavia, the Netherlands and beyond. The show’s companion website Equitrekking.com is home to four special interest blogs focusing on dude ranches, Darley’s equestrian travels and tips, the ex-racehorse adoption blog and the horse breed guide. Equitrekking.com also features everything visitors need to research and plan their travels, including the popular Travel Deals page with exclusive riding vacation and ranch deals, and the Equitrekking.com Vacation Guide, a searchable guide to dude ranches, cattle drives and worldwide riding holidays. Equitrekking.com’s sister websites include Top20Ranches.com, showcasing the team’s favorite North American dude ranches and EquitrekkingTravel.com, which focuses on exceptional international equestrian vacations. The travel experts at Equitrekking have named Sylvan Dale Guest Ranch a “Top 20 Ranch” on Top20Ranches.com, dedicated to the best North American dude ranches, guest ranches and family ranch vacations. The Equitrekking team crisscrosses the globe to find the best dude ranches, guest ranches, equestrian resorts and horseback riding travel destinations and films them for the Emmy Award-winning TV show Equitrekking and the popular companion website Equitrekking.com. In addition to Sylvan Dale Guest Ranch in Loveland, Colorado, top dude ranches include geographically diverse picks from Arizona, British Columbia, Colorado, Mexico, Montana, Wyoming, Georgia and Idaho. The Equitrekking team has spent the last six years traveling the world searching for the best ranches and horseback riding travel destinations. Having ridden and filmed at many of these ranches for Equitrekking, which broadcasts on PBS and international networks in over 82 countries, and writing about the dude ranch industry for leading publications, the team had a tough job in picking only twenty elite dude and guest ranches. In addition to the Emmy-winning TV show, the Equitrekking team also produces a popular companion website at Equitrekking.com featuring the Equitrekking Vacation Guide, a global guide to dude ranches, guest ranches, cattle drives and riding vacations, and exlusive ranch travel deals, also featured in the Equitrekking monthly e-newsletter. Launched in 2004, the Equitrekking Vacation Guide educates singles, families and groups of travelers seeking a vacation involving horse experiences and ranch adventures. The team has also produced a TV Special for PBS, “Great American Ranches,” highlighting the history of dude ranches in America. The high definition TV Special includes interviews with dude ranch owners, the history of the first dude ranch travelers and tips for travelers who want to saddle up at a Western-style ranch. Equitrekking is the Emmy Award-winning lifestyle television series that takes viewers on global travel and horseback riding adventures to experience culture, cuisine, history and nature. Hosted by travel expert and producer Darley Newman, Equitrekking broadcasts in high definition on PBS in North America and on international networks in over 82 countries. The show’s companion website Equitrekking.com features everything visitors need to research and plan their travels, including video clips, expert tips, travel articles and the Equitrekking.com Vacation Guide, a searchable guide to dude ranches, cattle drives and worldwide riding holidays. The travel experts at Equitrekking have named Lone Mountain Ranch in Big Sky, Montana a “Top 20 Ranch” on Top20Ranches.com, dedicated to the best North American dude ranches, guest ranches and family ranch vacations. The Equitrekking team crisscrosses the globe to find the best dude ranches, guest ranches, equestrian resorts and horseback riding travel destinations and films them for the Emmy Award-winning TV show Equitrekking and the popular companion website Equitrekking.com. This Montana guest ranch, listed on the National Register of Historic Places, has an enviable location only 20 miles from the Northwest corner of the Yellowstone National Park. Its all-inclusive offerings are diverse with horseback riding into Yellowstone, naturalist led hikes, canoe trips, fly-fishing, Yellowstone Park tours, mountain biking, an outdoor youth adventures program, BBQ’s, and more. In addition to Lone Mountain Ranch in Big Sky, top dude ranches include geographically diverse picks from Arizona, British Columbia, Colorado, Mexico, Montana, Wyoming, Georgia and Idaho. The Equitrekking team has spent the last six years traveling the world searching for the best ranches and horseback riding travel destinations. Having ridden and filmed at many of these ranches for Equitrekking, which broadcasts on PBS and international networks in over 82 countries, and writing about the dude ranch industry for leading publications, the team had a tough job in picking only twenty elite dude and guest ranches. Equitrekking, the Emmy Award-winning PBS travel TV series hosted by Darley Newman, has been honored by the National Academy of Television Arts & Sciences with a Daytime Emmy Award in the 40th Annual Daytime Entertainment Emmy® Awards. This is Equitrekking’s third Daytime Emmy Award win for Outstanding Single Camera Photography and its eighth nomination. Equitrekking’s Director of Photography Greg Barna attended The Daytime Entertainment Creative Arts Emmy® Awards gala in Los Angeles to accept the award. Equitrekking was also honored with nominations for Outstanding Special Class Writing and Outstanding Travel Program alongside The Ellen DeGeneres Show, Jack Hanna’s Into the Wild, and other exceptional television programs. The winning episode was filmed in Botswana. Five-time Emmy-nominated TV host Darley Newman led viewers through the Okavango Delta, one of Earth’s last great wilderness areas, and across the lunar-like Makgadikgadi Pans. Viewers at home embark on an exhilarating journey with Darley as she treks with the San, an ancient tribe from which scientists believe all people are descended. She visits a meerkat colony and sees how these fascinating creatures have perfected teamwork. She also goes fishing in a hippo pond, and is charged by an elephant while on horseback in the Okavango Delta. “It’s an honor for every member of our production team to receive Daytime Emmy Award nominations and very satisfying to win for Equitrekking’s beautiful photography,” said Darley. Equitrekking just completed its 36th episode. In addition to its North American broadcasts, Equitrekking is shown on international networks in over 82 countries including the U.K.’s Horse & Country TV, and networks in New Zealand, Italy, Russia, Japan and Turkey. For more information on the Equitrekking series, including photos and behind the scenes videos, please visit www.equitrekking.com/press. Equitrekking is the Emmy Award-winning lifestyle television series that takes viewers on global travel and horseback riding adventures to experience culture, cuisine, history and adventure—all with local people. Hosted by travel expert and producer Darley Newman, Equitrekking broadcasts in high definition on PBS in North America and on international networks in over 82 countries. The show’s companion website Equitrekking.com features everything visitors need to research and plan their travels, including video clips, expert tips, travel articles, exclusive travel deals and the Equitrekking.com Vacation Guide, which is a searchable guide to dude ranches, cattle drives and riding holidays. Additional websites at EquitrekkingTravel.com and Top20Ranches.com focuses on dude ranch and horseback riding vacations. Watch behind the scenes videos from Equitrekking. Equitrekking, the Emmy Award-winning PBS travel TV series hosted by Darley Newman, has been honored by the National Academy of Television Arts & Sciences today with three Daytime Emmy Award nominations in the 40th Annual Daytime Entertainment Emmy® Awards. The team received nominations for Outstanding Single Camera Photography (Greg Barna), Outstanding Special Class Writing (Darley Newman and Chip Ward) and Outstanding Travel Program (Darley Newman and Chip Ward). Equitrekking’s Botswana episode is nominated alongside The Ellen DeGeneres Show, Jack Hanna’s Into the Wild, and other outstanding television programs. Equitrekking has won two Emmy Awards, both for photography, after being nominated for eight Emmys over the past four years. Five-time Daytime Emmy nominated TV host Darley Newman travels with local people in each episode of Equitrekking to highlight great adventure, history, food, nature and culture. Darley horseback rides to get close to the land and reach hidden treasures in each place. By traveling with local people, viewers at home are given a more personal perspective of each area, showcasing the interconnectedness of humanity and what makes global cultures distinct. “We experience countries and culture through the lens of the locals. The great cities of the world are fascinating even as they become more similar. When we explore the interior of a country, we get a better sense of why things are the way they are. These rural and natural areas hold much of the ‘undiscovered’ wonders. It’s this ‘otherness’ that attracts the worldly traveler and those who we hope to inspire to hop on an airplane,” said Darley Newman. Equitrekking just completed its 36th episode. In addition to its North American broadcasts, Equitrekking is shown on international networks in over 82 countries including the UK, Ireland, New Zealand, Italy, Russia, and Turkey. The Daytime Entertainment Creative Arts Emmy® Awards gala will be held in Los Angeles in June. It will be telecast on the Turner Broadcast Networks HLN on Sunday evening, June 16, 2013. See a full list of this year’s nominees. For more information on the Equitrekking series, including photos and behind the scenes videos, visit www.equitrekking.com/press. Equitrekking is the Emmy Award-winning lifestyle television series that takes viewers on global travel and horseback riding adventures to experience culture, cuisine, history and adventure—all with local people. Hosted by travel expert and producer Darley Newman, Equitrekking broadcasts in high definition on PBS in North America and on international networks in over 82 countries. The show’s companion website Equitrekking.com features everything visitors need to research and plan their travels, including video clips, expert tips, travel articles and the Equitrekking.com Vacation Guide, a searchable guide to dude ranches, cattle drives and riding holidays. 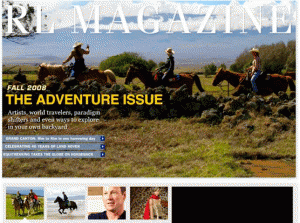 A second website at EquitrekkingTravel.com and Top20Ranches.com focuses on equestrian vacations. Equitrekking TV host Darley Newman has been named Travel Television Personality of the Year by the Travel Writers Association, a professional society of travel writers, travel photographers, and, related hospitality industry professionals. Seven winners were selected in recognition of their outstanding excellence in travel journalism, photography, publications, television and social media. Winners in this year's competition are: John Lamkin, Lifetime Achievement Award; Ann Lombardi, Travel Radio Personality of the Year; Laurel Robbins, Travel Blogger of the Year; DM Banks, TWA Member of the Year; TR Threston, Travel Writer of the Year; Darley Newman, Travel Television Personality of the Year; and Susan Frost, Travel Photographer of the Year. Winners will be honored at a Black Tie Awards Dinner in August, 2013 in New York City. "Our winners are superstars in their respective fields," said Ian Cook, CEO of the Travel Writers Association. “We are proud to have some of the best and brightest names in the business associated with our organization, and we congratulate our 2013 Award Winners." Darley Newman is the three time Daytime Emmy nominated TV host, writer and producer of the Emmy Award-winning TV series, Equitrekking, which broadcasts on PBS and international networks in over 65 countries. Darley travels the world with local people to discover history, diverse cultures, horse riding and adventure. She’s hiked with the San in Africa, horse ridden through the Jordan’s Wadi Rum Desert with the Bedouin and explored the Colorado Rockies with American cowboys. An entrepreneur and award-winning travel book author, Darley combined her passion for travel with her background in television to create Equitrekking. "It's an honor to be recognized by fellow travel journalists and media professionals," said Darley. "I'm looking forward to accepting this award at the annual black-tie awards ceremony later this year and, of course, continuing to show viewers stunning nature, history, culture and horses through my exciting global travel adventures with Equitrekking." Travel Writers Association is a professional, non-profit organization with these goals: 1) Keeping the integrity of travel journalists at a high moral standard; 2) professional and personal growth; 3) Networking with other professionals in travel journalism or travel related businesses. 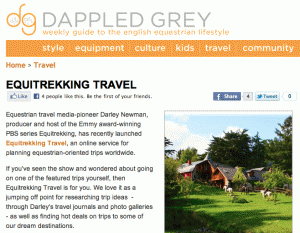 Learn more about Darley Newman and Equitrekking. Learn more about the Travel Writers Association. Please contact us for more information. The travel experts behind the Emmy-winning PBS TV show, Equitrekking, and popular companion website Equitrekking.com, have launched a brand new Equitrekking.com Travel Deals page featuring exclusive dude ranch discounts and bargains on horseback riding vacations you won’t find offered anywhere else. The Equitrekking.com Travel Deals page is continually updated with the latest travel deals at ranches, resorts, castles and with pack trip tour operators who offer horse riding and adventure vacations. Many of the featured vacations are with small, family owned businesses, whose deals aren’t available on major travel deals websites. Current Travel Deals include last minute holiday family ranch vacations, winter girlfriend getaways at Arizona dude ranches, special discounts on wild horse tours in Wyoming, all-inclusive guest ranch bargains, “learn to horse ride” packages at an Irish castle and more. In addition to being listed on Equitrekking.com, subscribers can find travel bargains in the free Equitrekking e-Newsletter. Equitrekking.com features a variety of riding vacation resources, including four special interest blogs, including the Dude Ranch Blog, and the Equitrekking Vacation Guide, a global guide to dude ranches, guest ranches, cattle drives and riding holidays. Launched in 2004, the Equitrekking Vacation Guide educates singles, families and groups of travelers seeking a vacation involving horse experiences and local culture in diverse global locations. The team has also produced a TV Special for PBS, “Great American Ranches,” highlighting the history of dude ranches in America and recently launched Top20Ranches.com, featuring their top twenty ranch vacations in North America. In addition to their online resources, Equitrekking has produced 35 episodes of their Emmy Award-winning series, which has won two Daytime Emmy Awards and received five nominations. Equitrekking is the Emmy Award-winning lifestyle television series that takes viewers on global travel and horseback riding adventures to experience culture, cuisine, history and nature. Hosted by travel expert and producer Darley Newman, Equitrekking broadcasts in high definition on PBS in North America and on international networks in over 65 countries. The show’s companion website Equitrekking.com features everything visitors need to research and plan their travels, including video clips, expert tips, travel articles and the Equitrekking Vacation Guide, a searchable guide to dude ranches, cattle drives and worldwide riding holidays. The travel experts behind the Emmy-winning PBS TV show, Equitrekking and popular companion website Equitrekking.com, revealed their top 20 North American dude ranch picks today on a brand new website, Top20Ranches.com. The top dude ranches include geographically diverse picks from Arizona, New Mexico, Colorado, Mexico, Montana, Texas, Georgia and Idaho. The Equitrekking team has spent the last six years traveling the world searching for the best ranches, resorts and horseback riding travel destinations. Having ridden and filmed at many of these ranches for their Emmy Award-winning TV show Equitrekking, which broadcasts on PBS and international networks in over 65 countries, and writing about the dude ranch industry for leading publications, the team had a tough job in picking only twenty elite dude and guest ranches. In addition to the Emmy-winning TV show, the Equitrekking team also produces a popular companion website at Equitrekking.com featuring the Equitrekking Vacation Guide, a global guide to dude ranches, guest ranches, cattle drives and riding vacations. Launched in 2004, the Equitrekking Vacation Guide educates singles, families and groups of travelers seeking a vacation involving horse experiences. The team has also produced a TV Special for PBS, “Great American Ranches,” highlighting the history of dude ranches in America. The high definition TV Special included interviews with dude ranch owners, the history of the first dude ranch travelers and tips for travelers who want to saddle up at a Western-style ranch. Equitrekking has produced 35 episodes of their Emmy Award-winning series, which won a second Daytime Emmy this spring for its photography. Throughout the fall, viewers can watch two new episodes from Botswana, Africa on their local PBS station and Equitrekking episodes from Belize, Costa Rica, Southern Quebec, Texas, Arizona, Utah, and Kentucky. Equitrekking’s just returned from the Upper Peninsula of Michigan, where they filmed in Mackinac Island, St. Ignace and Sault Ste. Marie for an episode that will debut Spring 2013 on PBS. For more information, visit www.top20ranches.com and contact us. Equitrekking, the Emmy Award-winning PBS travel TV series, has been honored with a Daytime Emmy Award for Outstanding Single Camera Photography. This is Equitrekking’s second Daytime Emmy Award. Equitrekking’s Director of Photography Greg Barna and his family attended the star-studded Los Angeles gala for the 39th Annual Daytime Entertainment Creative Arts Emmy® Awards and accepted the award for Equitrekking team, which consists of host, writer and producer Darley Newman and executive producer Chip Ward. Equitrekking was nominated alongside The Electric Company on PBS and Giada at Home on The Food Network. In past years, Equitrekking has been up against The Ellen DeGeneres Show, MTV’s Made, Jon Stewart’s landmark televised rally on Washington, DC’s Mall The Rally To Restore Sanity And/Or Fear and other major productions. Equitrekking has received five Daytime Emmy Award nominations, winning for Outstanding Single Camera Photography in 2009. The series was also honored with a nomination for Outstanding Special Class Series in 2009 and 2010, and for Outstanding Writing in 2011. “I’m incredibly proud of Greg. He’s a world-class talent and a terrific friend. There’s no one more deserving of this honor than he,” said executive producer Chip Ward. The Equitrekking TV show follows Darley Newman as she travels the world with local people to get an in-depth, eco-friendly look at a destination’s natural surroundings, culture and history. The tight-knit Equitrekking crew travels to dramatic and beautiful destinations, often riding horses to get to areas that aren’t normally showcased by the media. Young entrepreneurs, Darley and Chip, have built the Emmy-winning Equitrekking series from the ground up, using their complementary skill sets and passions to creatively produce and promote each episode through online video and the popular Equitrekking.com website. In addition to its North American broadcasts, Equitrekking is seen on international networks in over 65 countries including the Japan, France, Italy, Russia, and Turkey. The 39th annual Daytime Emmy Awards is a presentation of the National Academy of Television Arts & Sciences in cooperation with the Academy of Television Arts & Sciences. 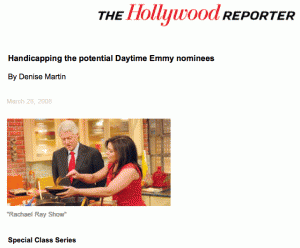 For more information visit daytimeemmys.tv. For more information on the Equitrekking series, including photos and behind the scenes videos, visit www.equitrekking.com/press. Equitrekking is the Emmy Award-winning lifestyle television series that takes viewers on global travel and horseback riding adventures to experience culture, cuisine, history and adventure. Hosted by travel expert and producer Darley Newman, Equitrekking broadcasts in high definition on PBS in North America and on international networks in over 65 countries. The show’s companion website Equitrekking.com features everything visitors need to research and plan their travels, including video clips, expert tips, travel articles and the Equitrekking.com Vacation Guide, a searchable guide to dude ranches, cattle drives and riding holidays. A second website at EquitrekkingTravel.com focuses on equestrian vacations. Watch behind the scenes videos on the filming of Equitrekking. Watch a behind the scenes and promo for our newest episodes from Botswana. Equitrekking, the Emmy Award-winning PBS travel TV series, has been honored with a Daytime Emmy nomination in the 39th Annual Daytime Emmy® Awards for Outstanding Single Camera Photography. This is the fourth consecutive year that Equitrekking has been nominated for a Daytime Emmy. Equitrekking is nominated alongside The Electric Company on PBS and Giada at Home on The Food Network. This is Equitrekking’s fifth Daytime Emmy nomination. Equitrekking won an Emmy for Outstanding Single Camera Photography in 2009. The series was also honored with a nomination for Outstanding Special Class Series in 2009 and 2010 and for Outstanding Writing in 2011. Awards will be presented at a gala in Los Angeles on June 17th. The Equitrekking TV show follows Darley as she travels the world with local people to get an in-depth, eco-friendly look at a destination’s natural surroundings, culture and history. The tight-knit Equitrekking crew travels to dramatic and beautiful destinations, often riding horses to get to areas that aren’t normally showcased by the media. Young entrepreneurs Darley and Chip Ward, the series executive producer, have built the Emmy-winning Equitrekking series from the ground up, using their complementary skill sets and passions to creatively produce and promote each episode through online video and the popular Equitrekking.com website. In addition to its North American broadcasts, Equitrekking is now seen on international networks in over 65 countries including the Japan, France, Italy, Russia, and Turkey. The 39th annual Daytime Emmy Awards is a presentation of the National Academy of Television Arts & Sciences in cooperation with the Academy of Television Arts & Sciences. To see a list of this year’s nominees, visit emmyonline.tv For more information on the Equitrekking series, including photos and behind the scenes videos, visit www.equitrekking.com/press/. Equitrekking is the Emmy Award-winning lifestyle television series that takes viewers on global travel and horseback riding adventures to experience culture, cuisine, history and adventure. Hosted by travel expert and producer Darley Newman, Equitrekking broadcasts in high definition on PBS in North America and on international networks in over 65 countries. The show’s companion website Equitrekking.com features everything visitors need to research and plan their travels, including video clips, expert tips, travel articles and the Equitrekking.com Vacation Guide, a searchable guide to dude ranches, cattle drives and riding holidays. 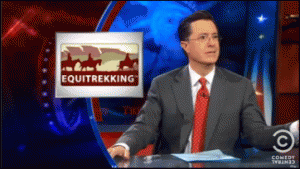 In September 2009, Equitrekking won a Daytime Emmy for Outstanding Single Camera Photography and was twice nominated for Outstanding Special Class Series, alongside the popular MTV series True Life and Made. In 2011, Equitrekking’s Darley Newman and Chip Ward were nominated for a Daytime Emmy for writing Equitrekking, up against The Ellen DeGeneres Show and Jon Stewart, Stephen Colbert and their team of 31 Comedy Central Writers. Equitrekking has twice been awarded First Place for Best Travel Broadcast in the North American Travel Journalist Awards Competition. Equitrekking’s companion book Equitrekking Travel Adventures on Horseback, published by Chronicle Books and written by Darley Newman, received the Merit Award for Best Travel Book 2008 from the North American Travel Journalist Association. The series has also received two Telly Awards for Photography and in the Travel & Tourism category. In addition to Equitrekking, Darley is a columnist Practical Horseman, DiscoverHorses.com and speaks frequently at events. Darley and Equitrekking have been featured in The Chicago Tribune, Washington Post, Ralph Lauren magazine, USA Today, New York Times, Budget Travel, Hollywood Reporter and the book How’d You Score That Gig, a look at the coolest careers for twenty and thirty-something’s, published by Ballantine Books/Random House. Darley is also the founder of Equitrekking Travel at EquitrekkingTravel.com, featuring exceptional equestrian vacations led by many of the local guides seen on the Equitrekking TV show. Equitrekking, the Emmy-award winning Public Television travel series hosted by Darley Newman, has been honored with two Telly Awards. The series, which has filmed 35 episodes taking viewers on eco-friendly, global travels to experience history, culture and adventure, has won a Silver Award for its Outstanding Cinematography and the Bronze Award in the Travel & Tourism category. With nearly 11,000 entries from all 50 states and numerous countries, the Telly Awards honor outstanding TV commercials and programs, the finest video and film productions, and online commercials, video and films. Winners represent the best work of the nation’s most respected production companies, television stations and cable operators. Equitrekking recently filmed in Botswana, Africa, walking with the San, horse riding to view elephants in the Okavango Delta and following in the footsteps of Africa’s early explorers in the stark Makgadikgadi Pans. In each episode, Darley and local guides discover the best of each destination as they ride horses and camels, hike, snorkel and sightsee in magnificent landscapes, capturing the world’s most beautiful locations and interesting cultures in high definition. Equitrekking has been nominated three years in a row for Daytime Emmys, most recently up against media moguls Ellen DeGeneres, Stephen Colbert and Jon Stewart, and won a Daytime Emmy for its Outstanding Photography. It has also twice won Best Travel Broadcast from the North American Travel Journalist Association. A prestigious judging panel of over 500 accomplished industry professionals, each a past winner of a Silver Telly and a member of The Silver Telly Council, judged the competition and Equitrekking, which is produced by the Bethesda, Maryland based production company DCN Creative. Learn more about Equitrekking and watch a promo for our new Africa episodes at Equitrekking.com and the Telly Awards at TellyAwards.com. Produced by DCN Creative, an award-winning TV and media production company, Equitrekking broadcasts on PBS stations and on international networks in over 65 countries. The series has been on PBS since 2007, garnering tens of millions of dedicated fans. The show’s companion website Equitrekking.com features everything visitors need to research and plan their travels, including video clips, expert tips, travel articles and the Equitrekking Vacation Guide, a searchable guide to dude ranches, cattle drives and riding vacations. EquitrekkingTravel.com, dedicated to exceptional equestrian vacations, features trips led by many of the locals seen on the TV show and features destinations as close to home as Vermont and as far away as South Africa and Turkey. Equestrian travel expert Darley Newman, a young entrepreneur who was recently recognized by Women in Leadership & Philanthropy as an Inspiring Woman, and frequently speaks and is profiled in the media for successfully launching her dream job, conceived Equitrekking and DCN Creative. Darley Newman, the host, creator, writer and producer of the Emmy-winning PBS TV series "Equitrekking” will be honored among six remarkable women at the Women in Philanthropy and Leadership (WIPL) Inspiring Women Awards on March 20th in Myrtle Beach, South Carolina. The Inspiring Women Awards were created as a lasting way to recognize the achievements of women who were born in South Carolina or who have adopted the Palmetto State as their home. The awards pay tribute to outstanding women for their contributions to the state, nation and world. Honorees reflect a diverse group of women from the arts, business, medicine, media, philanthropy and public service. Newman, who grew up in Myrtle Beach, is an inspirational entrepreneur who has carved out her dream career with her TV show, travel websites and award-winning book and writing. A true adventurer, Newman travels through global destinations with local people to introduce viewers to history, the environment and world cultures, promoting diversity and cross-cultural understanding. She has been honored with three Daytime Emmy nominations for her hosting, writing and producing up against such media moguls as Ellen DeGeneres, Jon Stewart and Stephen Colbert and grown her TV show to reach audiences throughout North America and in 65 other nations. 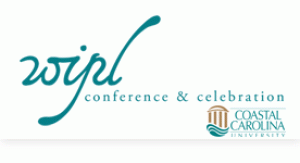 "In reviewing the names chosen by the nominations committee, I am confident they have selected a group of women who have demonstrated visionary leadership, determination, success and are a source of great inspiration,” said Terri DeCenzo, executive director for WIPL. “They have made a difference in many lives – not only within our community, but in the world. I look forward to sharing their stories and celebrating their impact." Newman will also speak on the afternoon of March 20th about how she launched her career and businesses, giving tips to other women on how they too can carve out their niche and create their dream job and life. At the Celebration of Inspiring Women, she will be honored beside Dr. Jeanne Fourrier, dentist, philanthropist, humanitarian; Patricia Harris, global chief diversity officer, McDonald's Corporation LLC; Anne Worsham Richardson, artist, naturalist, lecturer; Brig. Gen. Velma Richardson, U.S. Army retired, business development principal of Information Systems and Global Services; and Inez Tenenbaum, chairman of the U.S. Consumer Product Safety Commission. Equitrekking Travel, which features exceptional equestrian vacations from the Emmy Award-winning Equitrekking PBS TV show, has announced Largay Travel, a veteran Virtuoso travel agency, as their new Preferred Provider of Travel Services. The Equitrekking team, who started their business with a single Virtuoso agent two years ago, joined forces with Largay Travel to keep up with the demand from travelers for their riding vacations. Much of this interest is spurred by the popular Equitrekking TV series, which broadcasts nationwide on PBS stations and internationally in over 65 countries. At their interactive website, EquitrekkingTravel.com, equestrians and those seeking to horse ride while on vacation can choose from a variety of hand-picked riding holidays, many of which have been featured by equestrian travel expert and three time Daytime Emmy nominated TV host Darley Newman on Equitrekking. Photos, videos, traveler reviews, blogs, travel tips, detailed itineraries and more engage travelers with personal insight into each special vacation. Largay Travel, one of New England’s premier travel organizations, has been arranging exclusive travel experiences since 1969. Their dedicated team of 30 skilled advisors have been recognized for four consecutive years by Conde Nast Travel magazine as one of “America’s Top 100 Secret Travel Agents” and for the past 8 years has made the A-List of the world’s top travel agents published by Travel & Leisure magazine. With 26,000 eligible agents competing for these honors, Largay Travel continues to stand out and bring clients the best in adventure, family, cruising and African safaris. By working with Largay Travel, clients have the option for a full service experience from start to finish. This has been of special interest to equestrian groups, who receive special discounts and travel deals when booking a trip found on EquitrekkingTravel.com. Travelers also have access to trips found nowhere else, including EquitrekkingTravel.com’s exclusive Maui, Big Island and Cappadocia, Turkey horse riding vacations, a medieval village trek in Ireland and a special equestrian tour of Wales featuring riding Welsh Cobs in the breathtaking Cambrian Mountains, a visit to the Derwen International Welsh Cob Centre and a traveler favorite… a horse ride to the pub. Equitrekking Travel continues to rapidly grow its client base, increasing its revenue three fold in its second year of operations. 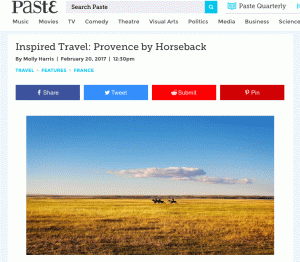 In addition to being featured on television in North America, Asia, Africa and Europe and earning high praise from travelers, Equitrekking Travel has been profiled in USA Today, The Boston Globe, Practical Horseman and Martha Stewart Radio. 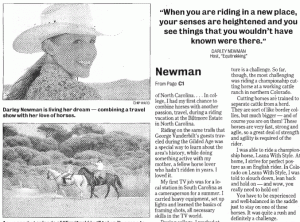 With an already popular TV series, Newman continues to spread the word about her personal passion for eco-friendly horseback riding exploration and supporting locally owned, sustainable small businesses, all the while working to serve a growing niche community of equestrian enthusiasts and their families. For more information, visit EquitrekkingTravel.com. 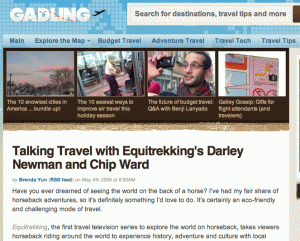 Equitrekking, the Emmy Award-winning Public Television travel series hosted by Darley Newman, begins broadcasts on the UK’s Horse & Country TV January 2, 2012. The Equitrekking TV show follows three time Daytime Emmy nominated TV host and equestrian Darley Newman as she travels the world riding horses with local people to get an in-depth, eco-friendly look at a destination’s natural surroundings, culture and history. Horse & Country TV reaches 10.5 million households in the UK and Ireland on SKY channel 280, providing exclusive sports event coverage, news, documentary and personality-led programming to the passionate audience for horse sports and country living. In Equitrekking’s first twenty episodes on Horse & Country TV, Darley travels with viewers through the lush countryside of Ireland, the rugged landscapes of Iceland, historic regions of Spain, rainforests in Belize and Costa Rica and snowy Quebec. Across America, viewers discover great ranches, national parks and historic sites in Vermont, North Carolina, South Carolina, Georgia’s Coast, Wyoming, Colorado, Hawaii's Big Island, Maui, Virginia Hunt Country, Texas, Arizona, Utah, Kentucky and California Wine Country. APT Worldwide, a leading provider of quality non-fiction programming in the international market, has secured international distribution deals for Equitrekking on networks in over 65 countries including France, Italy, Russia, Japan, and Turkey. The Equitrekking production team has filmed 35 episodes in the Middle East, South America, North America, Europe and Africa, recently returning from filming a variety of horse safaris and travel adventures in Botswana. Equitrekking.com, the companion site to the TV show, has a wealth of information on horseback riding and travel, including the comprehensive Equitrekking Vacation Guide, featuring dude ranches, working ranches, cattle drives, horse pack trips, riding vacations and great inns and resorts with horseback riding and a variety of additional activities for companions who don’t ride. Inspired by the Equitrekking TV show and led by many of the guides featured on the show, EquitrekkingTravel.com features exceptional global riding vacations. The Emmy Award-winning team of TV producers and equestrians at Equitrekking have launched a Gift Guide on Equitrekking.com to help shoppers find exceptional horse-inspired gifts for all budgets and tastes this holiday season, based on their own global travels and horseback riding adventures. The new, special section of Equitrekking.com features equestrian and travel inspired jewelry, apparel, books, toys, horse treats and art. The Equitrekking team selected creative and unusual finds, including horsey chocolates, a life sized stuffed pony for kids, vintage jewelry, personalized art and more, categorizing best picks for the holidays, horse owners, active equestrians and trail riders to make navigating the guide easy and fun. There’s a special section with ideas for horse-loving kids and their parents that includes shopping tips on finding memorable gifts for kids. The Equitrekking TV show follows three time Daytime Emmy Award nominated TV host and equestrian Darley Newman as she travels the world riding horses with local people to get an in-depth, eco-friendly look at a destination’s natural surroundings, culture and history. From their world travels and from riding horses at home, the tight-knit crew and staff at Equitrekking have personal experience testing out products and finding unique shopping venues, many of which are featured in the holiday gift guide. Equitrekking.com, the companion site to the TV show, has a wealth of information on horseback riding and travel, including the comprehensive Equitrekking Vacation Guide, featuring dude ranches, working ranches, cattle drives, horse pack trips, riding vacations and great inns and resorts with horseback riding and a variety of additional activities for companions who don’t ride. Young entrepreneurs Darley Newman and Chip Ward have built the Emmy-winning Equitrekking series from the ground up, using their complementary skill sets and passions to creatively produce and promote each episode through online video and the popular Equitrekking.com website. In addition to its North American broadcasts, Equitrekking is now seen on international networks in over 65 countries including the Japan, France, Italy, Russia, and Turkey. Just in time for summer travels, Equitrekking.com has launched an enhanced version of the popular Equitrekking Vacation Guide. 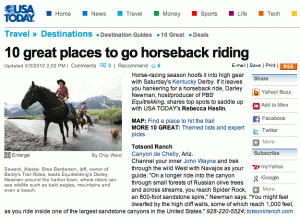 The Vacation Guide serves to help travelers easily find and discover horse-related vacation destinations. 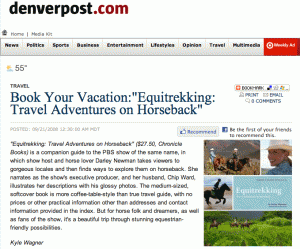 Equitrekking.com is the companion website to Equitrekking, the Emmy Award-winning lifestyle travel TV show on PBS. The Equitrekking Vacation Guide features the best places to saddle up and experience horse riding while on vacation. Destinations highlighted include historic dude ranches in Wyoming and Colorado, eco-friendly lodges and haciendas in South America, luxurious castles and estates in Ireland and France, horse safaris in Africa and horseback riding on the beaches of Costa Rica and Australia. Equitrekking.com now provides a variety of methods for visitors to search the Vacation Guide. Destinations are categorized by themes and activities, allowing travelers to find destinations that satisfy mixed groups of riders and their non-riding companions. Special tabs highlight luxury destinations, U.S. and Canadian vacations, ranch vacations and international riding holidays - giving visitors multiple ways to find their dream vacation. Equitrekking.com provides visitors everything they need to plan their travels including the travel blog of Equitrekking’s three time Emmy-nominated host and travel expert, Darley Newman, articles on horse related topics, stunning travel videos, travel tips, interviews with personalities living the equestrian lifestyle and candid reviews of global equestrian vacations. The information and insight on Equitrekking.com has been personally gathered by Equitrekking’s team of equestrians, journalists and producers who have traveled the world to research and evaluate content and information, making Equitrekking.com and the Vacation Guide a trusted travel resource. Equitrekking is an Emmy Award-winning lifestyle television series that takes viewers on global travel and horseback riding adventures to experience culture, cuisine, history and adventure. Hosted by travel expert and producer Darley Newman, Equitrekking broadcasts on PBS in North America and on international networks in over 65 countries. The show’s companion website, Equitrekking.com, features everything visitors need to research and plan their travels, including video clips, expert tips, travel articles and the Equitrekking.com Vacation Guide, a searchable guide to dude ranches, cattle drives and riding holidays. For more information about Equitrekking visit www.equitrekking.com. Equitrekking, the PBS travel series with host, producer and writer Darley Newman and executive producer and writer Chip Ward, has been honored with a Daytime Emmy nomination in the 38th Annual Daytime Entertainment Emmy® Awards for Outstanding Special Class Writing. This is the third consecutive year that Equitrekking, Darley and Chip have been nominated for Daytime Emmys. Equitrekking is nominated alongside The Ellen DeGeneres Show, Teen Kids News on Fox and Jon Stewart’s landmark televised rally on Washington, DC’s Mall The Rally To Restore Sanity And/Or Fear, which broadcast on Comedy Central. This is Equitrekking’s fourth Daytime Emmy nomination. Equitrekking won an Emmy for Outstanding Single Camera Photography in 2009 and was honored with a nomination for Outstanding Special Class Series in 2009 and 2010. Awards will be presented at a gala in Los Angeles on June 17th. The Equitrekking TV show follows Darley as she travels the world with local people to get an in-depth, eco-friendly look at a destination’s natural surroundings, culture and history. The tight-knit Equitrekking crew travels to dramatic and beautiful destinations, often riding horses to get to areas that aren’t normally showcased by the media. The episode that garnered this year’s Emmy nod is Equitrekking: Jordan: Wadi Rum, Aqaba & Jerash, in which Darley joins local Bedouin to discover the Middle Eastern Kingdom of Jordan, riding horses through the dramatic Wadi Rum Desert and Dana Village, snorkeling among vibrant coral reefs, hiking Jordan’s version of the Grand Canyon and experiencing NASCAR’s ancient counterpart during chariot races in a restored Roman hippodrome. Young entrepreneurs Darley and Chip have built the Emmy-winning Equitrekking series from the ground up, using their complementary skill sets and passions to creatively produce and promote each episode through online video and the popular Equitrekking.com website. In addition to its North American broadcasts, Equitrekking is now seen on international networks in over 65 countries including the Japan, France, Italy, Russia, and Turkey. The 38th annual Daytime Emmy Awards is a presentation of the National Academy of Television Arts & Sciences in cooperation with the Academy of Television Arts & Sciences. To see a list of this year’s nominees, visit emmyonline.org. More Information and press photos are available in the Press Center of Equitrekking.com. In September 2009, Equitrekking won a Daytime Emmy for Outstanding Single Camera Photography and has been nominated two years running for Outstanding Special Class Series, alongside the popular MTV series True Life and Made. Equitrekking has twice been awarded First Place for Best Travel Broadcast in the North American Travel Journalist Awards Competition. Equitrekking’s companion book Equitrekking Travel Adventures on Horseback, published by Chronicle Books and written by Darley Newman, received the Merit Award for Best Travel Book 2008 from the North American Travel Journalist Association. Equitrekking®, the Emmy Award-winning lifestyle travel series hosted by travel expert Darley Newman, debuts a new, fifth season of high definition episodes on Create® TV starting March 30th, taking viewers on global travel adventures in South America, the Middle East, Europe and North America. Create TV, a digital channel of popular Public Television lifestyle programs that reaches over 82% of U.S. TV households, will broadcast Equitrekking on Wednesdays and Sundays at 9:30am, 3:30pm and 9:30pm ET. The fifth season of Equitrekking includes thirteen half hour, high definition episodes from Uruguay, Alberta, Turkey’s Coast, Cappadocia & Istanbul, Jordan: Wadi Rum, Aqaba & Jerash, Jordan: Petra, Royal Stables & Dead Sea, Great National Parks, Great American Ranches, Vermont, the Carolinas, Georgia Coast, Wyoming, Colorado and Spain. In each episode of this eco-friendly travel series, Darley meets local people to experience history, adventure and culture both in and out of the saddle. Highlights include gaucho culture, rural estancias and the coastal cities of Montevideo and Punta del Este in Uruguay. On Turkey’s scenic Mediterranean Coast, Darley hikes the chilly waters of Saklikent Gorge and horseback rides through the abandoned Greek city of Kayaköy, before discovering Istanbul and Cappadocia. Alberta brings viewers on two different pack trips into Banff National Park and Kananaskis, riding to high altitudes and camping in the Canadian Rockies. Viewers then travel to a historic ranch in the foothills of the Rockies and into Calgary for the fast-paced Calgary Stampede. On a two-episode journey through the Middle Eastern country of Jordan, Darley rides with the Bedouin in the spectacular Wadi Rum Desert, explores magical Petra, hikes Jordan’s version of the Grand Canyon, snorkels in the Red Sea and floats in the Dead Sea. In the well-preserved Roman city of Jerash, Darley tries NASCAR’s ancient counterpart, dressing in Roman garb and hopping a ride on a horse drawn chariot. To gain insight into the history and characteristics of the Arabian breed, Equitrekking gains exclusive access to the Royal Stables, where Darley interviews HRH Princess Alia on an insider’s tour. Equitrekking Great National Parks takes a closer look at some of the remarkable landscapes, wildlife, and adventures in America’s National Parks. Parks profiled include Bryce Canyon and Capitol Reef in Utah, the Great Smoky Mountains in North Carolina, Canyon de Chelly in Arizona, Kenai Fjords in Alaska, Haleakala National Park on Maui, Hawaii Volcanoes National Park on Hawaii’s Big Island, Cumberland Island in Georgia and Yellowstone in Wyoming. Equitrekking Great American Ranches delves into the history, culture and scenery of historic ranches in Wyoming, Colorado, Arizona, Alberta, Texas, Maui and the Big Island. You can watch more of Equitrekking on Create TV, a PBS lifestyle channel that reaches over 82% of the U.S., starting March 30th. Here's the April schedule. EquitrekkingTravel.com, which features exceptional equestrian vacations based on the Emmy winning Equitrekking PBS TV show, is celebrating its one-year anniversary. Emmy nominated Equitrekking host and equestrian travel expert Darley Newman joined forces with longtime travel industry veteran and equestrian Julie Snyder in January 2010 to send equestrians and their non-riding companions on the special horse riding vacations they could previously only see on the popular Equitrekking TV show. Over the course of its first year, travelers rode with inspiring local guides in Costa Rica, Ireland, Spain, Hawaii, New Mexico, Alberta, and Wales and enjoyed EquitrekkingTravel.com’s exclusive experiences including the Jordan Bedouin Trek & Classic Tour, Maui and the Big Island equestrian vacations, the Irish Medieval Trek, Turkey: Cappadocia with Istanbul and more. Equitrekking reaches 94% of the U.S. on PBS and broadcasts on international networks in over 65 countries, taking viewers on global travel adventures to experience culture, cuisine, history and adventure. The series has been honored with three Daytime Emmy nominations and one win for its stunning photography. Taking full advantage of her new dream job, Snyder had a busy year scouting trips in Europe, Central America and the United States. Most notably, Newman and Snyder took a whirlwind trip through Ireland to experience equestrian vacations throughout the country. In addition to being featured in USA Today, Detroit Free Press, the Calgary Herald and Martha Stewart Radio, EquitrekkingTravel.com and Snyder have earned high praise from travelers. Snyder’s customer service and personal expertise in matching travelers with the appropriate trip, something of utmost importance for equestrian vacations in particular, has been an important asset for the new business enterprise. “We couldn’t be more pleased with the immediate success of Equitrekking Travel”, said Snyder, who has seen bookings increase exponentially in the first year, turning a two-fold profit in the first quarter alone. Equitrekking Travel’s growth is on target to make it the largest provider of equestrian vacations by volume. EquitrekkingTravel.com’s innovative website has also been key to the team’s success. Travelers like the detailed information, professional quality high definition video of many of the destinations filmed by Equitrekking’s Emmy winning producers, informational travel blogs, photo galleries and extensive first-hand information and trip details. 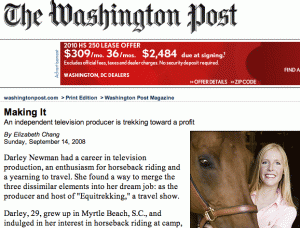 With an already popular TV series, Newman continues to spread the word out about EquitrekkingTravel.com’s quality vacations and her personal passion for eco-friendly horseback riding exploration, working to serve a growing niche community of equestrian enthusiasts and their families well into the coming years. For more information, visit EquitrekkingTravel.com's media section or contact us. Equitrekking, the Emmy Award-winning lifestyle series hosted by Darley Newman, debuts a new, fifth season of high definition episodes on PBS starting in November and December, taking viewers on global travel adventures in South America, the Middle East, Europe and North America. Darley and local guides discover the best of each destination’s culture, cuisine, history and adventures as they ride horses, hike, snorkel, and sightsee in stunning landscapes. Equitrekking broadcasts to 94% of the U.S. on PBS and international networks in over 65 countries. The fifth season of Equitrekking includes thirteen half hour, high definition episodes including: Uruguay, Alberta, Turkey’s Coast, Cappadocia & Istanbul, Jordan: Wadi Rum, Aqaba & Jerash, Great National Parks, Great American Ranches, Jordan: Petra, Royal Stables & Dead Sea, the Carolinas, Vermont, Georgia Coast, Wyoming, Colorado and Spain. Highlights of the new season include a visit to South America, where viewers experience eco-friendly estancias and the popular coastal cities of Montevideo and Punta del Este in Uruguay. On Turkey’s stunning Mediterranean Coast, otherwise known as the Turquoise Rivera, Darley hikes the chilly waters of Saklikent Gorge and horseback rides through the abandoned Greek city of Kayaköy, before discovering colorful spice markets and palaces in Istanbul and ancient villages in Cappadocia. Alberta brings viewers on two different pack trips into Banff National Park and Kananaskis, riding to high altitudes and camping in the Canadian Rockies. Viewers then travel to a historic ranch in the foothills of the Rockies and into Calgary for the fast-paced Calgary Stampede. “This season of Equitrekking is our most diverse yet. From riding with the Bedouin in the Middle East and the gauchos in Uruguay to visiting pristine national parks in the USA, we cover the globe and introduce viewers to the world’s most exotic and accessible destinations,” said Darley. On a two-episode journey through the Middle Eastern country of Jordan, Darley rides strong Arabian horses with the Bedouin in the spectacular Wadi Rum Desert, explores magical Petra and Dana Village on horseback, hikes Jordan’s version of the Grand Canyon, and floats in the Dead Sea. In the well-preserved Roman city of Jerash, Darley tries NASCAR’s ancient counterpart, dressing in Roman garb and hopping a ride on a horse drawn chariot. To gain insight into the history and characteristics of the Arabian breed, Equitrekking gains exclusive access to the Royal Stables, where Darley interviews HRH Princess Alia. Equitrekking Great National Parks takes a closer look at some of the remarkable landscapes, wildlife, and adventures in America’s National Parks. Parks profiled include Bryce Canyon and Capitol Reef in Utah, the Great Smoky Mountains in North Carolina, Canyon de Chelly in Arizona, Kenai Fjords in Alaska, Haleakala National Park on Maui, Hawaii Volcanoes National Park on Hawaii’s Big Island, Cumberland Island in Georgia and Yellowstone in Wyoming. Equitrekking Great American Ranches, delves into the history, culture and scenery of historic ranches in Wyoming, Colorado, Arizona, Alberta, Texas, Maui and the Big Island. Embed Equitrekking's season five promo from YouTube. Learn more about watching Equitrekking on PBS. Equitrekking, the Emmy Award-winning Public Television travel series, today announced the sale of its 26-episode high definition equestrian travel series to the Tabi Channel, a Japanese cable television channel specializing in travel. Equitrekking is broadcast on international networks in over 30 countries including the United States, France, Italy, Russia, and Turkey. This is Equitrekking’s first sale in Asia. APT Worldwide, a leading source for U.S. Public Television programming in the international market, made the sale. The deal was brokered by the Tuttle-Mori Agency. Tabi Channel is part of the Japan Entertainment Network (JEN), a subsidiary of Turner Broadcasting System, Inc. (TBS). TBS Inc, a Time Warner Company, is a major producer of news and entertainment products around the world and the leading provider of programming for the basic cable industry. The Equitrekking series follows host Darley Newman as she travels the world riding horses with local people to get an in-depth, eco-friendly look at a destination’s natural surroundings, culture and history. The tight-knit Equitrekking crew travels to destinations that are challenging to film on horseback, like the crater of a volcano on Maui, high altitudes in the Canadian Rockies, the jungles of Belize and the backcountry of snowy Quebec. The crew is currently in post production on a fifth season with episodes from Jordan, Turkey, Alberta, Uruguay and specials on Great Ranches and National Parks. Host Darley Newman and executive producer Chip Ward have recently been nominated for Equitrekking for a Daytime Emmy for Outstanding Special Class Series for the 37th Annual Daytime Emmy Awards. In September 2009, Equitrekking was honored with a Daytime Emmy for Outstanding Single Camera Photography and was also nominated in the Outstanding Special Class Series category alongside the popular MTV series True Life and Made. Last month, Equitrekking was awarded First Place for Best Travel Broadcast in the North American Travel Journalist Awards Competition for the second year running. Equitrekking is the Emmy Award-Winning PBS equestrian travel series that takes viewers on global horseback riding and travel adventures. Hosted by travel expert and journalist Darley Newman, Equitrekking broadcasts in high definition on PBS in North America and on international networks in over 30 countries Italy, Turkey, France, Japan, and Russia. Equitrekking’s current 26 half hour episodes feature Belize, Costa Rica, Southern Quebec, Vermont, the Carolinas, the Georgia Coast, Wyoming, Colorado, Spain, Iceland, Ireland, Hawaii's Big Island, Maui, Virginia Hunt Country, California Wine Country, Alaska, Wales, Scotland, Southern Spain, Quebec City & Beyond and Central Turkey. The crew is currently producing a new season in Uruguay, Alberta, Turkey, Jordan and beyond. The show’s companion website, Equitrekking.com, is a one-stop site for equestrian travel featuring video clips, the Equitrekking Travel Guide, expert tips, travel articles, Darley’s blog, photos and a monthly e-newsletter. Darley is also the founder of Equitrekking Travel at www.EquitrekkingTravel.com, featuring exceptional equestrian vacations led by many of the local guides seen on the Equitrekking TV show on Public Television. Equitrekking, the PBS travel series hosted and produced by Darley Newman with executive producer Chip Ward, has been honored with a Daytime Emmy nomination for Outstanding Special Class Series for the 37th annual Daytime Emmys. Equitrekking is nominated alongside Travel Channel’s The Relic Hunter and The Style Network’s Ruby, among other top programs. This is Equitrekking’s third Daytime Emmy nomination. Equitrekking won an Emmy for Outstanding Single Camera Photography in 2009 and was honored with a nomination for Outstanding Special Class Series. Awards will be presented in a gala in Los Angeles on June 25th. The Equitrekking TV show follows Darley as she travels the world riding horses with local people to get an in-depth, eco-friendly look at a destination’s natural surroundings, culture and history. The tight-knit Equitrekking crew travels to dramatic and stunning destinations that are challenging to film on horseback. Their most recent expedition took them to ride with the Bedouin in Jordan’s Wadi Rum Desert. Shortly before, they explored Alberta’s Rockies at high altitudes. Other notable adventures include riding along the beautiful and dangerous U.S. Mexico border and into the heart of Costa Rica’s jungles. Husband and wife team and young entrepreneurs Darley and Chip have built the series from the ground up, using their complementary skill sets and passions to creatively produce and promote each episode through online video and the Equitrekking.com website. In addition to its broadcasts on PBS stations and on CREATE, a Public Television travel, cooking and lifestyle channel, Equitrekking is broadcast on international networks in over 30 countries including Japan, France, Italy, Russia, and Turkey. The 37th annual Daytime Emmy Awards is a presentation of the National Academy of Television Arts & Sciences in cooperation with the Academy of Television Arts & Sciences. More information is available at Equitrekking.com. Equitrekking is the Emmy Award-Winning PBS equestrian travel series that takes viewers on global horseback riding and travel adventures. Hosted by travel expert and journalist Darley Newman, Equitrekking broadcasts in high definition on PBS in North America and on international networks in over 30 countries including Italy, Turkey, France, Japan, and Russia. Equitrekking’s current 26 half hour episodes feature Belize, Costa Rica, Southern Quebec, Vermont, the Carolinas, the Georgia Coast, Wyoming, Colorado, Spain, Iceland, Ireland, Hawaii's Big Island, Maui, Virginia Hunt Country, California Wine Country, Alaska, Wales, Scotland, Southern Spain, Quebec City & Beyond and Central Turkey. The crew is currently producing a new season in Uruguay, Alberta, Turkey, Jordan and beyond. The show’s companion website, Equitrekking.com, is a one-stop site for equestrian travel featuring video clips, the Equitrekking Travel Guide, expert tips, travel articles, Darley’s blog, photos and a monthly e-newsletter. Darley is also the founder of Equitrekking Travel at www.EquitrekkingTravel.com, featuring exceptional equestrian vacations in destinations visited and filmed by Equitrekking. The North American Travel Journalists Association (NATJA) today announced that Darley Newman, host and producer of the Emmy winning PBS travel series EQUITREKKING, has been selected as the First Place Prize Winner for Best Travel Broadcast in the 2009 North American Travel Journalist Awards Competition. This is the second consecutive win for the EQUITREKKING series. The competition, now in its 18th year, recognizes excellence in travel writing, photojournalism, multimedia platforms, advertising, marketing and public relations for the travel and tourism industry. This year NATJA received more than 500 submissions from the United States, Canada and the United Kingdom. EQUITREKKING was among a list of prestigious First Place Winners, including National Geographic Traveler, Travel + Leisure, Women's Adventure magazine and Virtuoso Life. “Choosing winners was difficult in this year’s competition because we received so many creative and well-executed entries in all of the categories,” says Helen Hernandez, CEO of NATJA. The EQUITREKKING travel television series currently broadcasts 26 high definition episodes on PBS and on international networks in over 30 countries. Host Darley Newman takes viewers on global horseback riding adventures to experience history, adventure and culture from a local’s perspective. In September 2009, EQUITREKKING was honored with a Daytime Emmy for Outstanding Single Camera Photography. EQUITREKKING was also nominated in the Outstanding Special Class Series category alongside the popular, longtime MTV series True Life and Made. The crew is currently filming for a fifth season in Jordan, Turkey, Alberta, Uruguay and beyond. 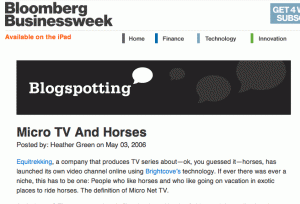 Besides the series’ companion book, Equitrekking: Travel Adventures on Horseback and website at Equitrekking.com, the crew recently launched EquitrekkingTravel.com, featuring exceptional equestrian vacations seen on the TV series. Now, viewers can ride in U.S. and international locales with the same locals who’ve starred on EQUITREKKING, and more great destinations will be added in the coming weeks. EQUITREKKING is the Emmy Award-Winning PBS equestrian travel series that takes viewers on global horseback riding and travel adventures. Hosted by equestrian travel expert and journalist Darley Newman, EQUITREKKING broadcasts in high definition on PBS in North America and on international networks in Italy, Turkey, France, Japan, Russia and beyond. EQUITREKKING’s current 26 half hour episodes feature Belize, Costa Rica, Southern Quebec, Vermont, the Carolinas, the Georgia Coast, Wyoming, Colorado, Spain, Iceland, Ireland, Hawaii's Big Island, Maui, Virginia Hunt Country, California Wine Country, Alaska, Wales, Scotland, Southern Spain, Quebec City & Beyond and Central Turkey. The crew is currently producing a new season in Uruguay, Alberta, Turkey, Jordan and beyond. The show’s companion website, Equitrekking.com, is a one-stop site for equestrian travel featuring video clips, the Equitrekking Travel Guide, expert tips, travel articles, Darley’s blog, photos and a monthly e-newsletter. Darley is also the founder of Equitrekking Travel at www.EquitrekkingTravel.com, featuring exceptional equestrian vacations led by the local guides seen on the EQUITREKKING series on Public Television. EQUITREKKING was awarded a Daytime Emmy in 2009 for Outstanding Single Camera Photography and nominated for Outstanding Special Class Series. The North American Travel Journalist Association awarded EQUITREKKING Best Travel Broadcast for 2008. EQUITREKKING’s companion book Equitrekking Travel Adventures on Horseback, published by Chronicle Books and written by Darley Newman, received the Merit Award for Best Travel Book 2008 from the North American Travel Journalist Association (NATJA). In addition to EQUITREKKING, Darley writes for Practical Horseman and True West magazines, Equisearch.com and speaks frequently at events. 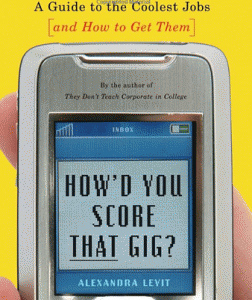 Darley and EQUITREKKING have been featured in the Washington Post, Ralph Lauren magazine, New York Times, and the book How’d You Score That Gig, a look at the coolest careers for twenty and thirty-something’s, published by Ballantine Books/Random House. Equitrekking, the Emmy Award-Winning Public TV series that is broadcast to tens of millions of viewers on PBS and international networks, announces the launch of Equitrekking Travel [www.EquitrekkingTravel.com]. This new enterprise will allow individuals and groups to enjoy in person the horse riding vacations they could previously only see on the popular Equitrekking television series. Equitrekking, the Emmy Award-Winning Public TV series that is broadcast to tens of millions of viewers on PBS and international networks, announces the launch of Equitrekking Travel. This new enterprise will allow individuals and groups to enjoy in person the horse riding vacations they could previously only see on the popular Equitrekking television series. The riding vacations will take place at featured locations and many will be led by the same guides who have appeared on Equitrekking's programs. The Equitrekking series is the first televised travel series to explore the world on horseback. Host Darley Newman travels off the beaten path, riding horses with local people to get an in-depth look at an area's natural surroundings, culture and history. Viewers, after watching these riding vacations in televised form during the last four seasons, have repeatedly asked how and where they might have the same equestrian experience. Thus, Darley decided to launch Equitrekking Travel as a forum through which viewers and their friends can also enjoy Darley's favorite equestrian trips, vacations that include horse riding with local guides as well as other activities featured on Equitrekking. As Darley has often said, "when you explore a place on horseback, you ride with local people who can show you the best of their area. This is my favorite way to travel. I learn tons of things that aren't found in any guidebook." Now viewers of Equitrekking who have dreamed of riding horses in locations where Equitrekking has gone will be able to actually experience what they have seen on the show. Darley has handpicked the sites that have been selected so far for Equitrekking Travel, because they offer accessible vacations that accommodate travelers with varying budgets and riding skills, including beginners and their non-riding companions. Horseback riding is an exciting, eco-friendly way to see the world and traveling with a local guide makes these journeys very special. Riders may participate in unique adventures like riding with the Bedouin in the desert in Jordan, cattle round-ups at a working ranch in New Mexico, cross country training in Ireland, a pack trip in the Canadian Rockies or Alaska, natural horsemanship at the Biltmore Estate in North Carolina, castles and stud farms in Wales, trail riding America’s National Parks in Utah and more. These new travel offerings include visiting magical Petra, exclusive access to Jordan’s Royal Stables, sightseeing in bustling Istanbul, fly-fishing in Wyoming, golf at Mount Juliet and castle tours in Ireland and Wales. The original, first-hand travel blogs, photographs and video from the best of the 35 Equitrekking episodes on EquitrekkingTravel.com, along with in-depth trip itineraries allow travelers to learn about where they are going before they get there. A Trip Finder and Best Picks section make searches for vacations based on adventure type and location even easier. Trips featured on EquitrekkingTravel.com can be booked by Equitrekking Travel’s preferred provider of travel services, Julie Snyder. Julie is an award winning "Virtuoso Travel Agent" as well as an experienced, enthusiastic equestrian. Julie can arrange all aspects of the vacation, including airfare, rental car, additional vacation days in cities and activities for companions who do not ride. Continually updated, the Equitrekking Travel Deals page features Last Minute Deals on equestrian vacations, Special Events that include access to high profile equestrian competitions at Spruce Meadows and the annual Calgary Stampede. EquitrekkingTravel.com Deal’s also feature Special Departures to train with an Olympic Dressage Rider in Spain or ride America’s National Parks in Utah. The Best Picks section of the website further categorizes trips to help visitors narrow their search. The Equitrekking monthly newsletter features these special deals, along with travel articles and vacation updates. 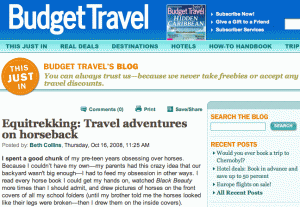 Darley’s Blog on EquitrekkingTravel.com highlights helpful tips on how to pack and prepare for an equestrian vacation, based on Darley’s expertise in riding the world. Darley Newman, host of the Emmy Award-winning Equitrekking TV series on PBS, will be speaking to audiences and showing stunning high definition video from her adventures traveling the world on horseback at the upcoming Equine Affaire exposition in Pomona, California February 4-7th. In California, Darley is scheduled to speak on February 4th at 1:00 pm on "Fun & Insightful Equestrian Destinations," Friday, Feb 5th at 10:00 am on "The Importance of Horses in International Cultures," and 5:00 pm on "Exploring the World on Horseback." Equine Affaire is a premiere equine exposition and equestrian gathering featuring World and National Champion competitors, clinics from top trainers and equestrian experts, and live demonstrations and seminars. During her first two presentations, Darley will be showing high definition video filmed around the world to demonstrate her topics, including never before seen footage from new Equitrekking episodes set to debut on PBS spring of 2010. Attendees can expect to see dramatic HD footage of horse travels and breeds from around the world including Iceland, Ireland, Hawaii, Wyoming, Alberta, Uruguay, Jordan, Spain, Wales, Texas, Costa Rica and more. While filming Equitrekking, Darley constantly encounters challenging places to explore on horseback, like the crater of a volcano on Maui, the backcountry in snowy Quebec, the varied terrain along the U.S. Mexico border, Jordan's desert with the Bedouin and the rainforest in Belize. She’s ridden championship-cutting horses in Colorado, award winning Andalusians in Spain, Quarter horses throughout the American West and Arabians in the Middle East. With Equitrekking, Darley combines her passion for horses and travel with her background in television production. Darley has worked at 48 Hours, CBS, the WB, The Talk Radio News Service and on various PBS documentaries and series. Learn more about Equitrekking on PBS, equestrian vacations at Equitrekking Travel and the Equine Affaire. Equitrekking, the Public Television travel series, has been honored with a Daytime Emmy Award for Outstanding Single Camera Photography. Darley Newman, Equitrekking’s host and producer, Chip Ward, Executive Producer, and Gregory Barna, Director of Photography, were honored with the Emmy at the Creative Arts Emmy Awards Black Tie Ceremony in Los Angeles this past weekend. September 1, 2009 –Equitrekking, the Public Television travel series, has been honored with a Daytime Emmy Award for Outstanding Single Camera Photography. Darley Newman, Equitrekking’s host and producer, Chip Ward, Executive Producer, and Gregory Barna, Director of Photography, were honored with the Emmy at the Creative Arts Emmy Awards Black Tie Ceremony in Los Angeles this past weekend. Equitrekking was also honored with a nomination for a Daytime Emmy for Outstanding Special Class Series. Alex Trebek, one of the hosts for the event, gathered with other celebrities including Susan Flannery, star of “The Bold and the Beautiful,” celebrity chef Ming Tsai, Nancy Cartwright of “The Simpsons,” talk show host Wendy Williams, members the cast of “Sesame Street” and television industry veterans to present the Daytime Emmy awards. PBS station schedules and more information are available on Equitrekking.com. 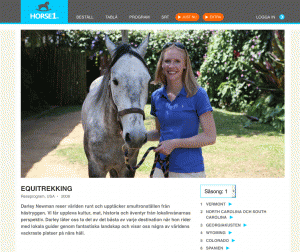 Scandinavian viewers can now watch Equitrekking on a new network in Sweden, Horse1TV. Viewers can enjoy Horse1TV on multi-screen devices, including online, on TV and beyond, watching the series through a variety of new mediums. The series is subtitled in Swedish. Learn more. 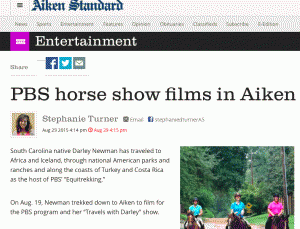 Equitrekking is featured in the Aiken Standard, showcasing the team's filming in South Carolina. "South Carolina native Darley Newman has traveled to Africa and Iceland, through national American parks and ranches and along the coasts of Turkey and Costa Rica as the host of PBS’ “Equitrekking.” On Aug. 19, Newman trekked down to Aiken to film for the PBS program and her “Travels with Darley” show.... Read more. Read about Equitrekking and top adventures you must try in the Spring 2015 issue of "Take the Reins," the magazine of the Interscholastic Equestrian Association. Read the story! DCN Entertainment, the production company behind Equitrekking on PBS, has formed a partnership with the AOL On Network and launched a new travel and lifestyle show on The AOL On Network, Travels with Darley, featured on a dedicated channel on AOL and distributed to over 2000 top media partners, including Huffington Post. This news has been featured in media industry publications including, VideoInk, AOL On Adds Travel Show from Emmy-Winning DCN Entertainment, and Cynopsis. 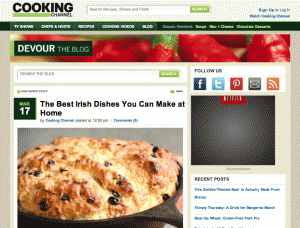 After visiting Ireland a few times and trying many of the classic dishes that Irish cooks and Irish families have come to love, Darley's shares her expert knowledge of "The Best Irish Dishes You Can Make at Home" with CookingChannel.com. 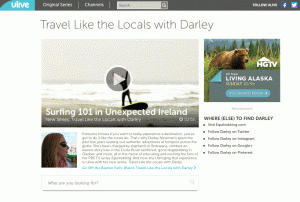 Travel Like the Locals with Darley, an original series with TV host Darley Newman, has launched this week on ulive, a lifestyle video site and distribution platform powered by Scripps Networks Interactive. The series, produced by the Emmy-winning team from DCN Entertainment, follows Darley and a cast of local people as they globe-trot the world showcasing culture, food, and accessible travel adventures from the eyes of those who live there. This great news has been featured in VideoInk, Cynopsis and more! 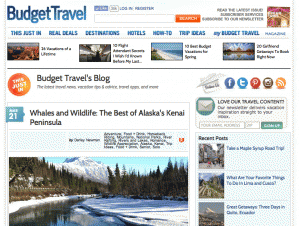 Darley shares her top picks for travel adventures on Alaska's Kenai Peninsula for Budget Travel in "Whales and Wildlife: The Best of Alaska's Kenai Peninsula." 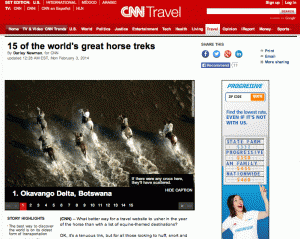 Darley helps CNN usher in the year of the horse with a list of equine-themed destinations that you can visit to saddle up with "15 of the world's great horse treks." 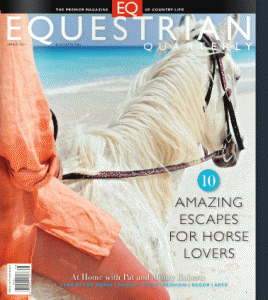 Read a profile of Darley Newman and Equitrekking in the Spring 2014 issue of Equestrian Quarterly (page 22 & 24), a beautiful, large printed magazine that reaches upscale equestrians across the US and Canada. The article is also now online on EquestrianQuarterly.com. 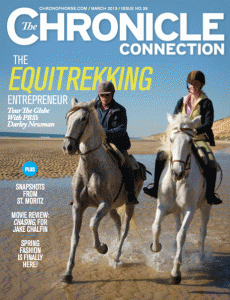 Equitrekking and TV host Darley Newman are the cover story of The Chronicle Connection. Jennifer B. Calder writes, "The appeal of the show, beyond the gorgeous scenery it showcases and the sense of adventure at its heart, is the mastery with which Newman introduces us to the endemic socieities and their customs... Newman's sincere curiosity seems to transcend any cultural or language barriers." Read more starting on page 30. Equitrekking has won a Daytime Emmy for Outstanding Single Camera Photography. This is our second Daytime Emmy Award win. 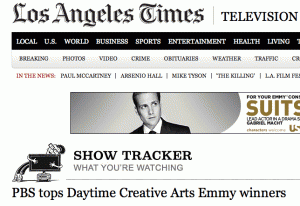 See the list of winners in the Los Angeles Times "PBS tops Daytime Creative Arts Emmy winners." Read more in depth coverage in The Aiken Standard and the DC Examiner also covered the news in "DC area's Louis C.K., Christina Hendricks, Equitrekking, Homeland win awards." 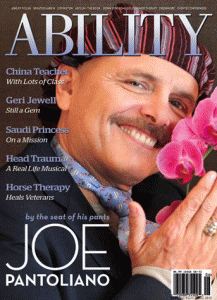 Equitrekking TV host, writer and producer Darley Newman's feature on how horses are helping wounded veterans heal is in the June/ July issue of ABILITY Magazine, consistently ranked on the Top 50 Magazines in the World. 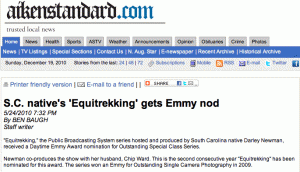 Equitrekking's Daytime Emmy nomination news is featured in the Aiken Standard and DC Examiner. This is the fourth consecutive year that Equitrekking has been nominated for a Daytime Emmy and the series' fifth nomination. Equitrekking won a Daytime Emmy in 2009 for Outstanding Photography. Darley's feature on traveling through the Okavango Delta in Botswana, Africa is in the spring issue of Women's Adventure Magazine. Turn to page 48. Read Jae-Ha Kim's interview with Darley Newman in the Chicago Tribune and Hartford Courant. Jae-Ha Kim is a New York Times bestselling author and writes "Go Away With..." -- a celebrity travel column that allows readers to vicariously travel along with stars. Kim writes, "There are many lifestyle shows about travel, but Darley Newman has tapped into a unique niche." Read a feature on Darley Newman, who "puts her own twist on travel—and crafts an enviable career—as the horseback-riding host of the PBS series Equitrekking." 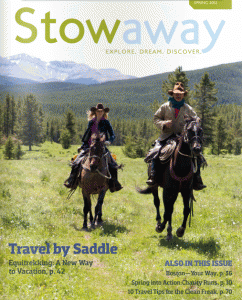 Equitrekking and Darley Newman are the cover story for the spring issue of Stowaway Magazine, a travel magazine geared specifically to young adults with tight budgets who want to dream, explore, and discover the world. The feature is by Lindsay Brown, who writes "Horseback riding is not the only adventure Darley undertakes in the filming process. In an attempt to fully experience the native culture, she is also busy hiking, whitewater rafting, climbing trees, and floating in the Dead Sea. And Darley is not the only one up for an adventure. The entire Equitrekking film crew is right alongside her, sharing in her adventures." Equitrekking host, creator, writer and producer Darley Newman will be honored alongside six amazing women at the at the Celebration of Inspiring Women on March 20 at the Women's Leadership Conference in Myrtle Beach, South Carolina. In addition to Darley, the 2012 recipients include: Dr. Jeanne Fourrier, dentist, philanthropist, humanitarian; Patricia Harris, global chief diversity officer, McDonald's Corporation LLC; Anne Worsham Richardson, artist, naturalist, lecturer; Brig. Gen. Velma Richardson, U.S. Army retired, business development principal of Information Systems and Global Services; and Inez Tenenbaum, chairman of the U.S. Consumer Product Safety Commission. The Equitrekking series debuts on yet another international network, Horse & Country TV, which reaches 10.5 million households in the UK and Ireland on SKY channel 280, providing exclusive sports event coverage, news, documentary and personality-led programming to the passionate audience for horse sports and country living. In addition to PBS in North America, Equitrekking broadcasts on international networks in over 65 countries. Listen to Equitrekking host Darley Newman's take on the horse / human relationship with radio host Sam Litzinger on The Animal House Radio Show on WAMU, Washington, DC's NPR station. Ben Baugh, a veteran writer for the Aiken Standard Newspaper writes, "Equitrekking, the Emmy Award-winning travel series that can be seen on PBS, will be broadcast in the United Kingdom and Ireland and will start airing on Jan. 2 on Horse and Country TV." 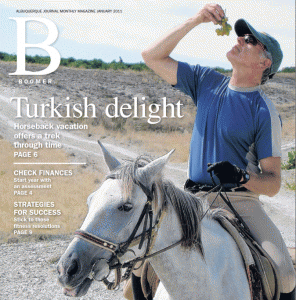 Baugh also features Equitrekking's new holiday gift guide. 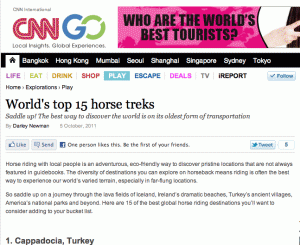 Read Darley Newman's "World's top 15 horse treks" on CNNGo.com. As the foremost expert on riding vacations and horse riding travel, Darley was chosen to present her top 15 picks for saddling up around the world. Kathleen Broadhurt interviews Darley for a GoNomad feature "Equitrekking Mini-Guide: Off the Bus and into the Saddle." Kathleen writes that Equitrekking is "a new form of travel that combines adventure, horses, and eco-tourism." David Hofstede writes, "What could be better than seeing the world on horseback? Not much can compare. But for those who can’t get away, Equitrekking is the next best thing." Stephen Colbert talks about his competition for the Daytime Emmy Awards - Equitrekking - on Comedy Central's The Colbert Report. Equitrekking's Darley Newman and Chip Ward were nominated for a Daytime Emmy for Outstanding Special Class Writing up against 10 writers from The Ellen DeGeneres Show, including Ellen herself, and Jon Stewart, Stephen Colbert and their team of 33 writers! Ben Baugh profiles Darley Newman and Equitrekking... "The combination of life long passions served as the inspiration and the realization of a dream vocation for Equitrekking host, creator and producer Darley Newman." Amy Sutherland writes, "Hawaii is not short on horses, but you’ll be hard pressed to find a ranch with accommodations. Equitrekking of PBS fame solves that problem with this package that combines a four-night stay at the oceanfront Hilton Waikoloa Village resort, car rental, and three different rides from the resort..." View these vacations at EquitrekkingTravel.com. 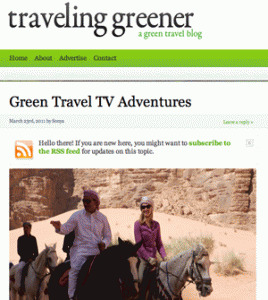 Traveling Greener publishes a guest post by Equitrekking host and producer Darley Newman about eco-friendly adventures that viewers can experience in the new season of Equitrekking. Heather Carreiro talks equine culture and travel with Darley Newman, the creator and TV producer behind the Emmy award-winning series Equitrekking. 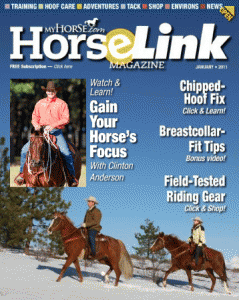 EquitrekkingTravel.com's Costa Rica equestrian vacations are featured in HorseLink magazine with a special video tour of Costa Rica. Travel journalist Susan Seligman, inspired by Equitrekking's Central Turkey episode on Public Television, travels with her husband to ride horses on EquitrekkingTravel.com's special Cappadocia, Turkey horseback riding vacation. Susan's story is the cover story for the February 2011 magazine. For the past year, EquitrekkingTravel.com has been making the dreams of horsemen come true through the various equestrian vacations they offer. Darley is interviewed for the first ever, Portrait of a Belle, where each month The Travel Belles introduce you to a woman who in her own unique fashion, epitomizes what it means to be a Travel Belle. Ben Baugh continues his coverage of Equitrekking's Emmy winning TV show in the "Aiken Standard", featuring the new, fifth season starting now on PBS stations. Die-hard equestrian Athena Arnot-Copenhaver set out in search of some of the greatest horseback riding adventures from here to Timbuktu and writes that Equitrekking Travel is "Considered one of the best companies to offer world-class riding for all skill levels, from fast-paced gallopers to beachside lopers..."
Equitrekking host Darley Newman is interviewed for "10 Great" by Rebecca Heslin of USA Today on Darley's picks for 10 Great Accessible Day Horseback Rides in the USA. Elizabeth Chang features Darley’s career evolution. Equitrekking host Darley Newman hosts Equitrekking segments for RLTV, Ralph Lauren's online entertainment channel. 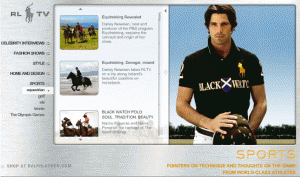 "Equitrekking Revealed," an interview with Darley on the creation of Equitrekking and "Equitrekking: Donegal Ireland," where Darley horseback rides on the beach in Ireland, appeared alongside Ralph Lauren model and polo player Nacho Figueras-- not bad company! 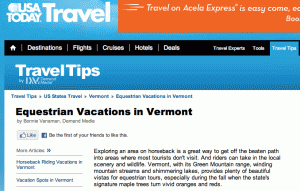 Equitrekking and Equitrekking Travel's Vermont Green Mountain Vacation are featured in USA Today's Travel Tips, "Equestrian Vacations in Vermont" by Bonnie Vanaman. "Equitrekking Travel was inspired by the Emmy Award-winning PBS series "Equitrekking," and the Vermont tour the company offers has been featured on that program." In "Hey, Darley Newman, How'd You Create An Emmy-Winning Travel Show, Equitrekking?" Andrea K. Hammer interviews Equitrekking host Darley Newman for the popular "How'd They Do That" series on MediaBistro.com. "It's really difficult to get into broadcasting," says Newman, "but the good news is that there are many new outlets through various types of media." Here, Darley tells us how she did it. "And she (Newman) does cover great distances (without having to worry about miles per gallon and carbon offsets! ), often riding to places that are far from the beaten path. Sound like something you'd be interested in? Good news: if the show inspires you to take up our own equitrekking hobby, you can actually visit the places Newman and her film crew take you in the show." Gadling reporter Brenda Yun Talks Travel with Darley Newman and Chip Ward calling Equitrekking an "an eco-friendly and challenging mode of travel." Beth Collins writes, "when a book called Equitrekking came across my desk recently, it made perfect sense to drop everything else I was doing and read it. The book, a companion guide to the public television series of the same name, follows author Darley Newman as she rides horses through amazing destination after amazing destination—the coast of Ireland, Iceland, the Carolinas, Vermont, Hawaii's Big Island, and lots more. Equitrekking host Darley Newman is profiled in Alexandra Levit's book about dream jobs for 20 and 30 something's published by Ballantine/ Random House. Several quotes from Darley appear in the book and the chapter on making it as a Travel Journalist. "If you can find a niche in the marketplace and convey your passion, then you have a good chance of succeeding," says Darley. 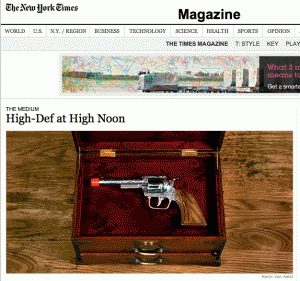 Equitrekking gallops into the Virginia Heffernan’s article in the New York Times. “Equitrekking, a video-sharing site that augments a high-def TV series from PBS of the same name, shows riders in Stetsons touring the world on horseback. Against spectacular backdrops, the horses do everything from gallop to ford rivers to ride herd. Who doesn’t want to do that?" Listen to Equitrekking host Darley Newman talking horses and travel on "Around the World Travel Radio," which airs on Southern California on AM 1290 KZSB out of Santa Barbara and is syndicated in Australia. 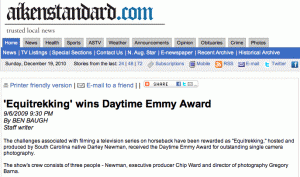 Ben Baugh writes "S.C. native's 'Equitrekking' gets Emmy nod" in the Aiken Standard. "Equitrekking, the Public Broadcasting System series hosted and produced by South Carolina native Darley Newman, received a Daytime Emmy Award nomination for Outstanding Special Class Series." The Equiery features Equitrekking and host Darley Newman, a Maryland resident, in the May Trails & Land issue. 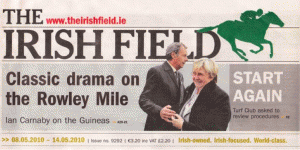 Equitrekking's visit to Ireland made international headlines in The Irish Field, Ireland’s only newspaper dedicated to racing and equestrian sports. "Broadcast on American television, Equitrekking is run by Darley, who, due to the high demand for riding holidays here, came over with travel agent Julie to check out some of the more popular destinations for their new holiday package offers." 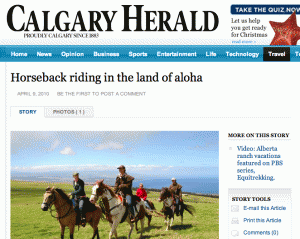 Equitrekking Travel's Hawaii Self Drive featured in "Horseback riding in the land of aloha" in the Calgary Herald. "With its Hawaii offering, guests get to experience three thoroughly different views of the Big Island of Hawaii with a self-drive and guided horseback riding adventure. Two of the days take place at historic ranches and another day takes guests to some of the state’s most spectacularly lush valleys." 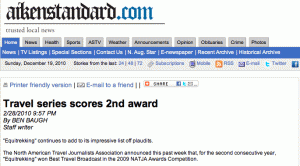 Ben Baugh of the Aiken Standard features "Travel series scores 2nd award." 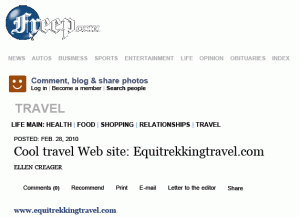 Baugh writes, "'Equitrekking' continues to add to its impressive list off plaudits. The North American Travel Journalists Association announced this past week that, for the second consecutive year, Equitrekking' won Best Travel Broadcast in the 2009 NATJA Awards Competition." 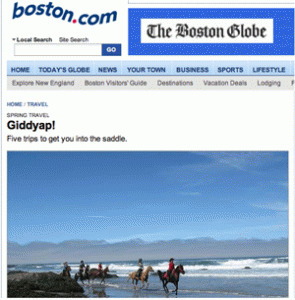 The Detroit Free Press names EquitrekkingTravel.com "Cool Travel Web Site." 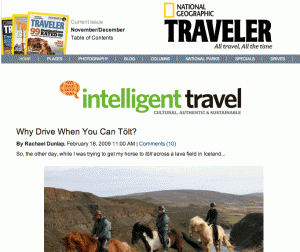 Ellen Creager writes, "If you've already done the dude ranch in Wyoming, this site opens up new choices, like riding in County Galway, Ireland; in the Wadi Rum desert in Jordan, or in rural Iceland on a Viking horse. It has plenty of U.S. destinations, too." 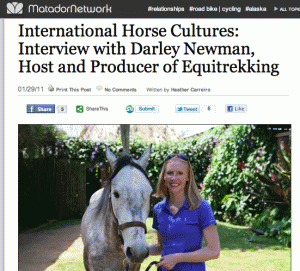 Learn more about Equitrekking host and Equitrekking Travel founder Darley Newman in this interview in The Equinest. "Since our crew is often all on horseback, it’s a challenge to travel and film in these remote areas. I don’t have a lot of time to get used to a lot of the different horses that I ride, so I’m learning their personalities as we film," said Darley. "Equestrian travel media-pioneer Darley Newman, producer and host of the Emmy award-winning PBS series Equitrekking, has recently launched Equitrekking Travel... If you've seen the show and wondered about going on one of the featured trips yourself, then Equitrekking Travel is for you. We love it as a jumping off point for researching trip ideas - through Darley's travel journals and photo galleries - as well as finding hot deals on trips to some of our dream destinations." 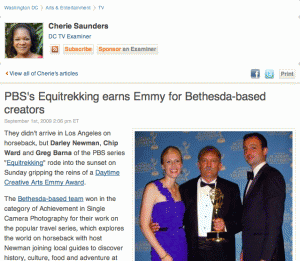 "PBS's Equitrekking earns Emmy for Bethesda-based creators... They didn't arrive in Los Angeles on horseback, but Darley Newman, Chip Ward and Greg Barna of the PBS series 'Equitrekking' rode into the sunset on Sunday gripping the reins of a Daytime Creative Arts Emmy Award." "The challenges associated with filming a television series on horseback have been rewarded as "Equitrekking," hosted and produced by South Carolina native Darley Newman, received the Daytime Emmy Award for outstanding single camera photography." El Pais, Uruguay's national newspaper, writes about Darley’s visit to Uruguay to film Equitrekking. Darley has received an outpouring of emails from people in Uruguay following this feature. The Travel Queen, Jane DeGrow, talks with Darley about filming in Uruguay and the new season of Equitrekking on PBS. 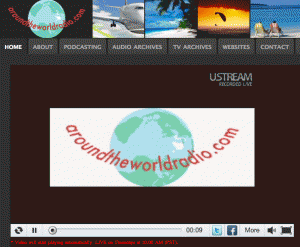 Listen online. Kyle Wagner reviews the Equitrekking Travel Adventures on Horseback book and writes, "show host and horse lover Darley Newman takes viewers to gorgeous locales and then finds ways to explore them on horseback... it's a beautiful trip through stunning equestrian-friendly possibilities." In Denise Martin's Handicapping the potential Daytime Emmy nominees article in the Hollywood Reporter, Brent Stanton, executive director of the Daytime Emmy Awards program, says, "Series that stand out so far include PBS' equestrian-themed travel show "Equitrekking"; TLC's documentary series "A Baby Story," which has won twice; and last year's winner, MTV's teen transformation hour "Made." While Equitrekking did not receive a nomination in 2008, it's first year on PBS, it did receive two nominations and won one Daytime Emmy in 2009 and has just received another nomination in 2010. Darley and Equitrekking are profiled by Denise Duguay. Staff writer Douglas Durden interviews Darley Newman about the Equitrekking concept and her drive to see the series succeed. 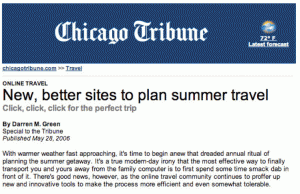 Darren Green's article lists Equitrekking.com in "New, better sites to plan summer travel." Darren writes, "For those who haven't yet seen Equitrekking, it's an international video series that allows the viewer to explore the world on horseback... Those looking for a true equine adventure should also check out Equitrekking's World Vacation Guide, which includes a clickable map highlighting horseback riding options worldwide." And why not? The company already films loads and loads of video and then edits that down into half-hour shows for TV. How better to use that leftover film than putting it online and maybe even syndicate it to other sites…."